A new atelier and gallery is coming to town. On Friday, May 18, the Colette Cosentino Atelier + Gallery opens to the public with its inaugural exhibition featuring works by famed interior designer John Saladino. The atelier is the brainchild of Santa Barbara–based artist Colette Cosentino, a historical decorative painter and muralist who has been creating works in the area for more than 25 years. Specializing in bucolic landscapes, rural life, and florals with a vintage flare, Cosentino has painted everything from ceiling murals and decorative floors to kiln-fired tiles and set props. The space will serve primarily as her art studio, with exhibitions taking place three or four times each year. Cosentino envisions it as an unconventional space in which people can learn about her work and process while also experiencing the work of important painters. With so many talented artists in the area, she hopes to bridge the architecture and design community with contractors and homeowners — offering a space where the public can envision new possibilities for interior décor. Having worked with Saladino on projects for more than two decades, Cosentino was delighted to have him be the inaugural exhibiting artist. 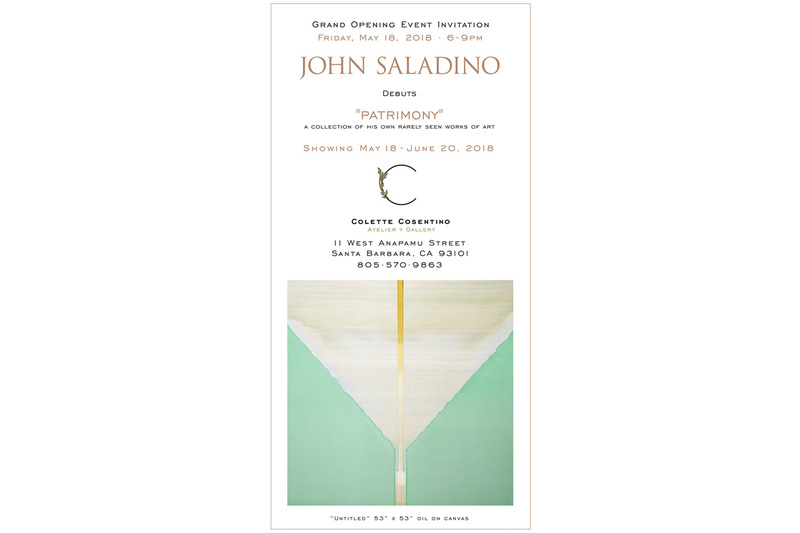 Saladino’s exhibition is titled Patrimony and will feature eight of his rarely seen paintings, available for purchase. Icons of interior design, Saladino’s work draws inspiration from color-field painting and minimalism, with the artist interested in exploring the relationship between harmony, color, and proportion. With the gallery focusing primarily on painting, viewers will also have the chance to consistently check out Cosentino’s work and discover the projects on which she’s focused. Eventually she hopes to consider how the space could become a place for teaching — bringing back the true tradition of the atelier. In the meantime, she’s dedicated to celebrating Santa Barbara’s unique perspective where painting meets architecture and design. An opening reception will take place on Friday, May 18, 6-9 p.m., at 11 West Anapamu Street.